Sunday afternoon Laura and I arrived in Puno, the boarder town before Bolivia. 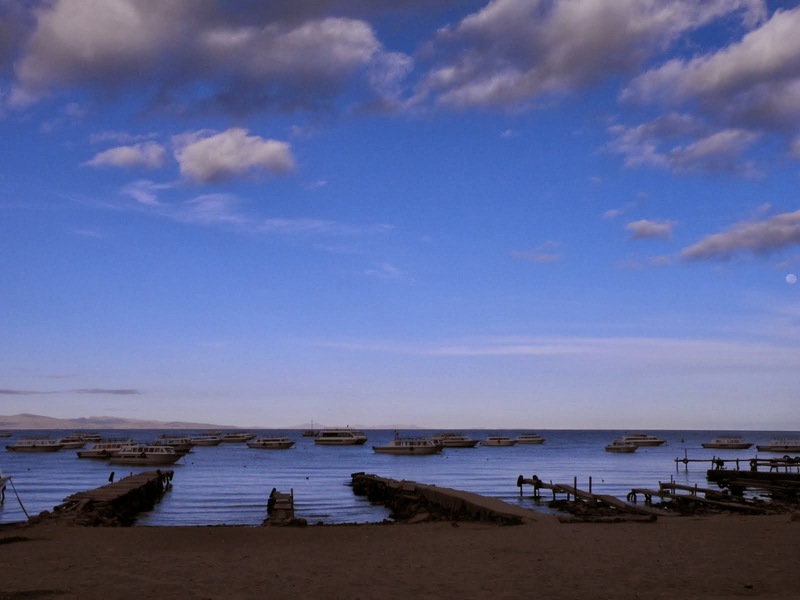 Puno is located on Lake Titicaca and has tours to the Floating Islands where the indigenous people live. As we arrived in Puno we heard, from Oli who owns a number of different bars and hostels in Peru and Bolivia, that the Bolivian side of Lake Titicaca was much better. So we decided to skip Puno and head to Copacabana, Bolivia. At 5:45am Monday morning I was woken up by our dormmates at Bothy Hostel packing and rushing out of the room to catch the 7:30am bus to Copacabana. At 8am Laura and I woke up to go to the Bolivian Consulate to get our visas (required for Americans only). We heard that at the consulate the visa was only $100 instead of $135 at the boarder. We arrived at the consulate and they said, "no it is the same at the boarder just go and pay money, no problem." After that unsuccessful attempt to save $35 we went to book our bus ticket. Turns out there are only two buses to Copacabana, one at 7:30am and one at 2:30pm. Dang it! We should have chased our early rising dormmates to the 7:30 am bus. So we had to waste an afternoon (not much to do in Puno) in Puno just floating around when we could have been enjoying Copacabana. After spending the afternoon at an Internet cafe uploading pictures we went to the bus station. At 2:19pm I realized I had left my iPod under my pillow on my dorm bed at Bothy Hostel. As I frantically ran around asking in my "fluent" Spanish if I had time to take a taxi back to Bothy the bus driver went back and forth between yes, we have time and no, no time. I even asked if the bus would stop at the hostel. That was a no. We drove away from Puno with only my memories of my pink iPod case and my iPod under my pillow. Bolivia and the US are not friends. Americans (and only Americans) have to pay $135 dollars to get into the country. And yes the fee is only accepted in US dollars. We arrived at the boarder crossing where we had to fill out a very long visa form (we skipped the box that asked for our social security number). As we handed over our visa form and passport to the immigration officer he through it in a pile not even looking at it or our Yellow Fever Vaccination form. The immigration office did not even have computers to scan our passports. It was weird but we had made it to Bolivia and we can come back for the next five years for free. We arrived in Copacabana shortly after the boarder crossing. Copacabana is on Lake Titicaca (the highest lake in the world) and there are islands off the shore that are suppose to be beautiful. As we arrived in Copacabana and hostel shopped we found out that there is only one ATM in town and it is inside a bank that is closed almost always. It is open for three hours a day in the afternoon. Great, we have no money but have just paid $135 dollars at the boarder, how ironic. Laura and I frantically started to look over our cash situation, we had $15 and about 40 soles ($10). We exchanged every sole we could find into Bolivianos and realized the Isla del Sol tour was out of the question. We had just enough money for our hostel room, a shared pizza for dinner, and our bus tickets to La Paz. So glad we missed the Floating Islands in Peru for the amazing islands on the Bolivia side. Traveling- what a day.